Paul Tsui, aged 32, with his sleeves rolled up poses, with a European Revenue Officer. Lawrence Tsui adds more to our growing information about the proposed Ping Shan airport. He has sent an extract from his father’s autobiography which highlights tensions regarding constructing the airport in this location. Paul Tsui talked about working under John Barrow, the District Officer for the NT. 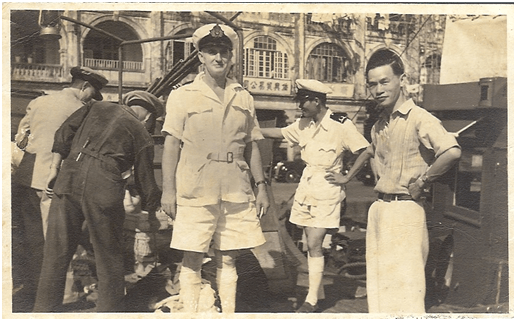 He mentioned that it was awkward that his boss, Barrow, an experienced AO pre-war, was a Lieutenant, while Tsui was a Captain in the BMA. The RAF proposal of building an airfield at Ping Shan was a tough issue to tackle. The RAF as prestigious in winning the war for Britain, but Barrow had the integrity to question the judgment and oppose the proposal of the RAF. Barrow fought it on the grounds of the treaty with China (2nd Beijing Convention?) in which it was held that the property rights of the people of NT was to be regarded as ‘sacred’, and resumption of their lands would have to be done under due process of the law and some decision of the Governor-in-Council, as well as with clear public purpose and due compensation. He raised hell when the RAF acted without regard for due process. He was supported by the Chief Civil Affairs Officer, Mr. D.M. MacDougall. They insisted on due process of land resumption and commenced land demarcation and identification of owners. The proposed RAF airfield construction was stopped at its track. Later in 1951, Paul Tsui was assigned to be District Officer of the Ping Shan area. This article was first posted on 20th December 2013.